Nurses Jennifer Edwards, middle, and Sarina Fazio, right, teach Diane Goodman, a research project participant, how to connect her watch-like device to her online patient portal. Heather M. Young led a project where nurse coaches worked with patients to develop health goals coupled with wearable devices; the resulting patient-generated data was integrated into the electronic health record. After helping to guide UC Davis Health’s growth, two top leaders are shifting gears to focus on America’s fast-growing senior population. 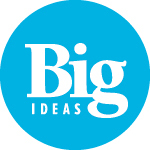 The Healthy Aging in a Digital World ‘Big Idea’ leverages the university’s strengths in telehealth, gerontology and interdisciplinary expertise to empower healthier aging via technology. Imagine an 85-year-old staying healthy through balance exercises with feedback from sensors built into a wristwatch — that also connects with her family in case of a fall. Or a 60-year-old who ensures he’s taking his cancer medications appropriately with a smartphone app that links to his clinician. Or a retired couple being able to continue their dream vacation after a frightening health hiccup, thanks to a quick medication adjustment based on real-time data. 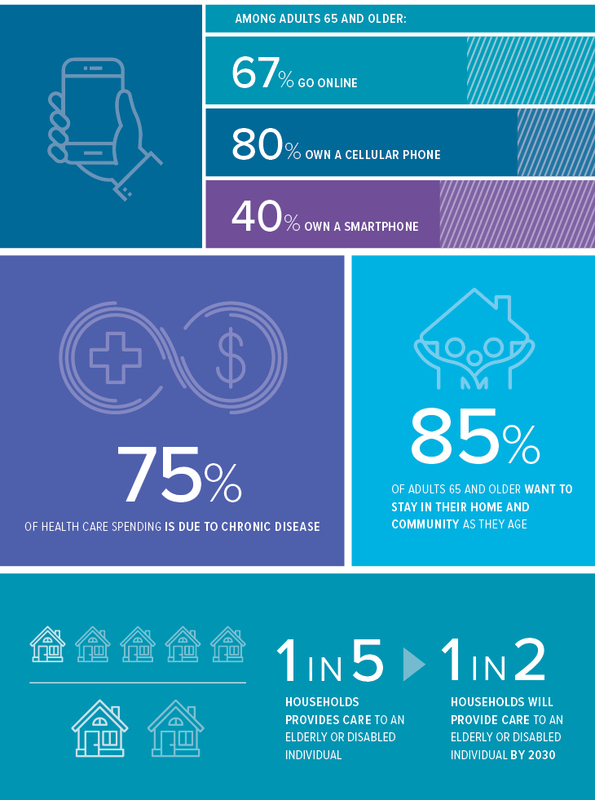 In a nation where 1 in 5 people will be of retirement age by 2030, technology-driven improvements to daily life can make a big difference in helping seniors to stay healthy, active and independent — and out of the clinic or hospital as much as possible. Technology can help individuals to achieve personal goals, and help them or their informal caregivers to stay in regular communication with care teams. In turn it can also enhance providers’ knowledge to help deliver better care, if developed in partnership with users and their health care systems. We know that technology by itself does not solve problems. It’s imperative that we work with individuals, families and communities to identify what technology provides the best value, and the most meaningful solutions, in the context of daily life. UC Davis has a formal vision to make technology work to improve health and provide efficient care across a person’s lifespan, and especially in their increasingly longer “golden years.” The Healthy Aging in a Digital World initiative is a long-term research project that’s one of several formal ‘Big Ideas’ at UC Davis — a series of forward-thinking, interdisciplinary projects or programs designed to positively impact the world for generations to come. The aging initiative’s champions are also two of UC Davis Health’s most prominent leaders, both representing unique strengths the university can apply to advance the issue. Co-champion Heather M. Young, a nationally renowned gerontology and nursing expert, was founding dean of the innovative, leadership-focused Betty Irene Moore School of Nursing at UC Davis. 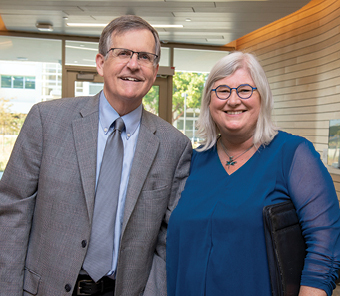 And co-champion Nesbitt, a pioneering national leader in telehealth and distance education, served two interim periods as UC Davis Health’s vice chancellor for Human Health Sciences. After shifting gears away from their overall leadership responsibilities for the health system and School of Nursing, Young and Nesbitt are working with a diverse team of UC Davis experts to develop and evaluate creative solutions that enhance the daily health lives of older individuals. “Technology has become very ubiquitous — most people are walking around with a cell phone and often a wearable device as well — and being able to harness data from that to improve health is very exciting,” Young said. “It takes things out of the clinical setting and means that each of us, in our own way, can own our health and set our own goals for the conditions we’re grappling with. Studies do show that as people age, the vast majority want to continue to reside in their homes. A major goal of Healthy Aging in a Digital World is improving their capacity to do so — and thrive in the process — through technology and personalized care. Team members envision a world where personal devices, home monitors and mobile apps empower people — and their caregivers, often family members or loved ones — to drive their own health in the home environment as much as possible. In turn, they expect that seamless technology-driven communication between patient and clinician will generate a treasure trove of new knowledge that health professionals can use to inform and improve practice. Technology has become very ubiquitous — most people are walking around with a cell phone and often a wearable device as well — and being able to harness data from that to improve health is very exciting. It takes things out of the clinical setting and means that each of us, in our own way, can own our health and set our own goals for the conditions we’re grappling with. Addressing how devices can mitigate loneliness and its effect on health. Vivek Murthy, a former Surgeon General of the United States, likens the impact of loneliness on health to obesity or smoking 15 cigarettes per day. UC Davis researchers will look at what robotic devices might reduce loneliness, or which assistive technologies may promote more social interaction. Supporting care partners by enabling technology to successfully foster wellness. In 2015 nearly 66 million Americans identified as informal and family care partners who provide care to someone who’s ill, disabled or aged. “Technology can safely bring family caregivers into the process and allow them to confidently be the ‘hands at home’ of the professional when we’re engaging with a patient,” Nesbitt said. Tailoring care to achieve the greatest outcome for people who have chronic illness. Tracking health regularly — versus only at the beginning of periodic clinic visits — can provide better insights and allow providers to analyze information for predictive factors of future disease. Preventive interventions can follow at both the individual and population levels. Generating evidence-based guidance that informs industry, and bridges developing technology with real-life home health needs. “We’re committed to bridging the digital divide between the companies that design technology and the health systems that provide care,” Nesbitt said. Providing innovative training opportunities for health care practitioners, who can then partner with patients and their care partners in ways that recognize their expertise. “We know that technology by itself does not solve problems,” said Young, who worked as a geriatric nurse practitioner in community-based long-term care environments before entering academia. “It’s imperative that we work with individuals, families and communities to identify what technology provides the best value, and the most meaningful solutions, in the context of daily life. 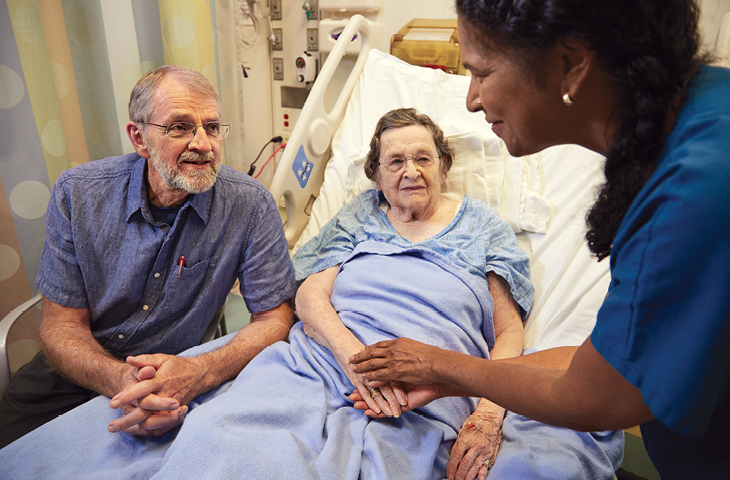 The School of Nursing and AARP are partnering on videos that help family caregivers manage common situations, such as when a loved one transitions from hospital to home (above). More and more seniors are expected to receive the bulk of their care at home rather than the hospital, making technology a key solution. To learn more about the initiative, please contact Sallie Grace Tate, assistant dean for advancement, at sgtate@ucdavis.edu or 916-734-2783. Health monitoring devices that track vital signs and physical activity, and passively send information to a medical record or care team. Simplified two-way, interactive videoconferencing from the home, between the patient and care team members such as a nurse, physician, or nutritionist. Medication adherence systems that integrate reminder messengers in pill boxes and bottles — or even in digestible form within pills themselves. A multitude of other possibilities. For example, some home security systems alert the homeowner every time the garage door opens. A similar system could alert a relative if an aging parent hasn’t opened the refrigerator by breakfast time, indicating a possible problem. Healthy Aging in a Digital World is one of several Big Ideas — forward-thinking, interdisciplinary programs and projects that will build upon the strengths of UC Davis to positively impact the world for generations to come. Learn more at bigideas.ucdavis.edu.